The 1830s Georgian manor Dunbrody Country House Hotel & Restaurant in Arthurstown, New Ross, County Wexford, Ireland proves that luxury does indeed come in small packages. Chef/Owner Kevin Dundon and his wife, Catherine, own the 15-room and 7-suite luxury property that is a member of the Small Luxury Hotels of the World. 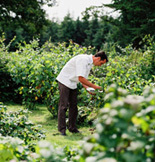 Nestled on 200 park-like acres, the hotel has much to offer guests from its Cookery School, The Spa at Dunbrody, and its excellent restaurant, The Harvest Room. Kevin Dundon is a master chef, whose illustrious credentials include working as the top toque in many prestigious restaurants in Canada and Ireland before purchasing Dunbrody Country House Hotel & Restaurant with his wife in 1998. He is also a regular on the radio and television on RTE - The Afternoon Show and on UK Food Live. 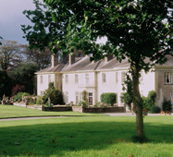 Edward F. Nesta and I stayed at Dunbrody Country House Hotel & Restaurant in September 2007, and thoroughly enjoyed our stay experiencing The Harvest Room restaurant as well as indulging in pampering treatments at The Spa at Dunbrody. The weather was perfect during our stay, and we enjoyed sitting outside looking at the pretty grounds, and strolling through the floral and fruit gardens, as well as the herb, and vegetable gardens where Irene, the gardener, pointed out some of the more unusual items in the gardens. It was during one of our strolls where I "discovered" Delago, who I learned is Kevin's pet Vietnamese pot-bellied pig. A welcoming mascot wearing a bright red harness, I could not resist, and gave her gentle pats whenever I passed by her large kennel. We stayed in a spacious two-room suite with sumptuous cream and sky blue brocade window treatments with elegant tassels framing the windows and the French doors in the sitting room that lead out to the garden. There was a crystal chandelier, a black leather sofa with decorative pillows, an oval butler's table with a selection of magazines, Bose radio/CD/DVD, and a writing desk and chair placed in the corner of the room. The white marble bathroom featured a walk-in shower and separate tub, toilet, robes, hairdryer, and a selection of Moulton Brown amenities. The bedroom featured a king bed with a wood headboard, and was dressed with an ivory and blue toile matelasse coverlet and decorative pillows. Cream and blue fleur de lis wallpaper added elegance to the walls, and a crystal chandelier was placed over the round wood dining table with three chairs upholstered with hunter green fabric where we enjoyed taking tea in the afternoon. 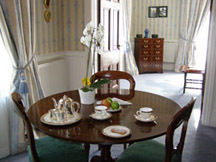 An orchid plant and a plate of crisp apples on the table beckoned invitingly. There was an armoire, nightstand and a bureau, which had brass lamps with cream shades, as well as a Philips television, and Bose radio/CD/DVD. Attention to small details included potpourri in a coupe glass and a Battenberg lace tissue cover on the bureau. 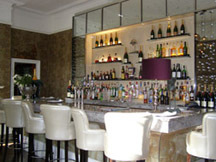 The hotel has wonderful pockets of rooms where guests may relax for a private moment, as well as an intimate and stylish bar, and an important factor for many guests is that there are disabled-friendly and ground floor rooms available. 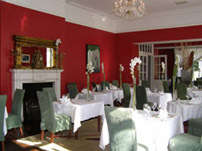 Dunbrody Country House Hotel & Restaurant may be on the small size, but its heart and hospitality is pure luxury. Read about Dunbrody Country House Hotel & Restaurant in the Restaurants, Chefs' Recipes, Spas, and Luxury Products sections. Please read other articles on Ireland in the Destinations, Hotels and Resorts, Restaurants, Chefs' Recipes, Spas, Liquor Cabinet: Celtic Crossing Liqueur, Boru Vodka, Knappogue Castle Irish Whiskey, Fashion, Adventures, and Luxury Products sections. © December 2007. Luxury Experience. www.LuxuryExperience.com All rights reserved.